The view from Cape Sounion, including the barren island of Patroklos on the left. ​It was a mid-August workday, when Sophia and I decided to take a short drive to Cape Sounion. We wanted to combine a visit to the ruins of the ancient Greek Temple of Poseidon, the God of the Sea, with a relaxing swim in the clear blue waters of the small bay, just before the site. The less-than-an-hour 69-kilometers drive along the Southeastern coastline of Attica takes the visitor halfway through the densely populated southern suburbs of Athens, lined with contemporary "short highrise" buildings, of both residential, commercial and office use, through Glyfada, and then, from the area of Vouliagmeni and Varkiza onward, the austere, barren, rocky landscape of Attica, with scattered buildings of questionable aesthetics and, on the side of the sea, the calm, blue, inviting waters of the sea, with the occasional sporty sailing boat or the impatient motorboat crossing the waters, going to the numerous short-distant destinations along the coastline to Sounion, leaving behind them the white line trace of their course as a witness to their pleasure. The ruins of the temple of Poseidon are perched on the headland, surrounded by the sea on its three sides. The site is a popular excursion from Athens, and, with a bit of lack, offers an unparalleled sunset over the Aegean Sea, as viewed from the ruins, a much sought-after spectacle. On the longest day of the year, the sun sets exactly in the middle of the caldera of the island of Patroklos, the extinct volcano that lies offshore, suggesting some astrological significance for the siting of the temple. It recounts the mythical tribulations suffered by Odysseus in his ten-year sea-voyage to return to his homeland Ithaca from the war in Troy. This ordeal was supposedly inflicted upon him by Poseidon, to whom the temple at Sounion was dedicated. We are told that, as the various Greek commanders sailed back the Greek mainland from Troy, the helmsman of King Menelaos of Sparta's ship died at his post while rounding "sacred cape Sounion, of Athens". Menelaos landed at Sounion to give his companion full funeral honors. Archaeological finds on the site date from as early as 700 BC. Herodotus tells us that in the 6th c. BC, the Athenians celebrated a quadrennial festival at Sounion, which involved Athens' leaders sailing to the cape in a sacred boat. The original, Archaic Period, temple of Poseidon was probably destroyed in 480 BC by Persians during Xerxes I's invasion of Greece (the second Greco-Persian War). Although there is no direct evidence for Sounion, Xerxes certainly had the temple of Athena, and everything else on the Acropolis of Athens razed as punishment for the Athenians' defiance. After they defeated Xerxes in the naval Battle of Salamis, the Athenians placed an entire enemy trireme (warship with three banks of oars) at Sounion, as a trophy dedicated to Poseidon. ​​The later temple at Sounion, whose columns still stand today, was probably built ca. 440 BC, during the ascendancy of Pericles in Athens, who also rebuilt the Parthenon. In 413 BC, during the Peloponnesian War against the Spartans, the Athenians fortified the site with a wall and towers, to prevent it from falling into Spartan hands. This would have threatened Athens' seaborne supply route from the island of Evia. Athens' supply situation had become critical, since the city's land supply lines had been cut by the Spartan fortification of Dekeleia, in north Attica. Not long after, Sounion was seized away from the Athenians by a force of rebel slaves from the nearby silver mines of Laurion. Statue of Poseidon, Greek National Archaeological Museum, Athens. The temple of Poseidon is perched above the sea at a height of almost 60 m. The design of the temple is a typical hexastyle (i.e. it had a front entrance with 6 columns). Only some columns of the temple stand today, but intact it would have closely resembled the contemporary and well-preserved Temple of Hephaestus (aka Thesseion) beneath the Acropolis, which may have been designed by the same architect. The building was rectangular, with a colonnade of Doric order on all four sides. The total number of original columns was 42 of which 15 columns still stand today. They were made of locally-quarried white marble. They were 6.10 m (20 ft) high, with a diameter of 1 m (3.1 ft) at the base and 79 cm (31 inches) at the top. At the center of the temple would have been the hall of worship (naos), a windowless rectangular room. It would have contained, at one end facing the entrance, a colossal, ceiling - height (6 m) bronze -probably gold-leafed- statue of Poseidon, who was usually portrayed carrying a trident, the weapon he used to stir up storms. The temple of Poseidon was destroyed in 399 by Emperor Arcadius. Archaeological excavations of the site in 1906 uncovered numerous artifacts and inscriptions, most notably a marble kouros statue and an impressive votive relief, both now in the Greek National Archaeological Museum. Μany parts of the temple were taken and transported either in museums or private collections. Thus, 5 column drums are in England at Chatsworth (and support the statue of the 6th Duke of Devonshire! ), 3 in Venice and 3 in Germany (Potsdam). The ruins bear among hundreds of others over time, the deeply engraved name of English romantic poet Lord Byron, who mentions Sounion in his poem Isles of Greece. The signature of historian and philhellene George Finlay, his friend and companion, is visible from the distance dictated by the protective wire. The philosopher Martin Heidegger also visited Sounion during his journey to Greece in 1962, as described in his book Sojourns. He refers to the "gleaming-white ruins of the temple". In the strong sea breeze "these few standing columns were the strings of an invisible lyre, the song of which the far-seeing Delian god let resonate over the Cycladic world of islands". He marvels at "the way that this single gesture of the land suggests the invisible nearness of the divine and dedicates to it every growth and every human work" (ibid). He goes on to reflect "the people of this country knew how to inhabit and demarcate the world against the barbarous in honor of the seat of the gods ...they knew how to praise what is great and by acknowledging it, to bring themselves in front of the sublime, founding, in this way, a world". On our visit, we found the archaeological site surprisingly quiet, since a tourist bus was leaving upon our arrival. The visitors that enjoyed the site along with us were no more than a couple of dozen, so we all had ample room to move, photograph, and take in the majestic beauty and the historical significance of the monument, that has survived over 2500 years so that we may form an idea of our own as to the glory that Greece is through the ages. After our visit, and as the temperature was rising, we drove less than a mile downhill and enjoyed the clear blue waters of the sea, on a beach where fragments of ancient construction material or artifacts worn to no recognition but visible to the curious mind were scattered throughout. 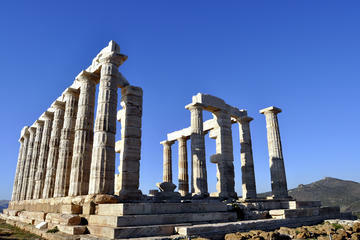 We strongly recommend a visit to Sounion and to the Temple of Poseidon. For a range of day trips and tours to Sounion from Athens, please check the relevant page of Viator, a TripAdvisor company. Or, check out Sunset tour Cape Sounion & Temple of Poseidon from €57 + Hotel pick up service + Professional guide by Keytours, Greece. ​Finally, for a page full of travel resources, including links to flights to Greece or within Greece, hotel, villa, exclusive resorts or home rentals, cruises, yachting and sailing, car rentals, tours and excursions, even travel insurance, visit this page, and you are half way to Athens already! A half-day tour -just for you- to one of the most impressive and picturesque ancient sites in Greece, the Temple of Poseidon at Cape Sounion. Sensational views of the sacred temple, the Saronic islands and the Aegean sea. Enjoy this customized tour with full personal attention from your private driver/guide. Set out on an easy & full of views drive along the coastline of Attica and all the way to the well-preserved ancient site at Cape Sounion. Gaze out across the Aegean Sea from the ruins of the Temple of Poseidon. Later, enjoy a picnic lunch at a nearby coastline location with a magnificent Mediterranean view. Opt in for an extra stop at a beautiful lake. Temple of Poseidon, Cape Sounion. 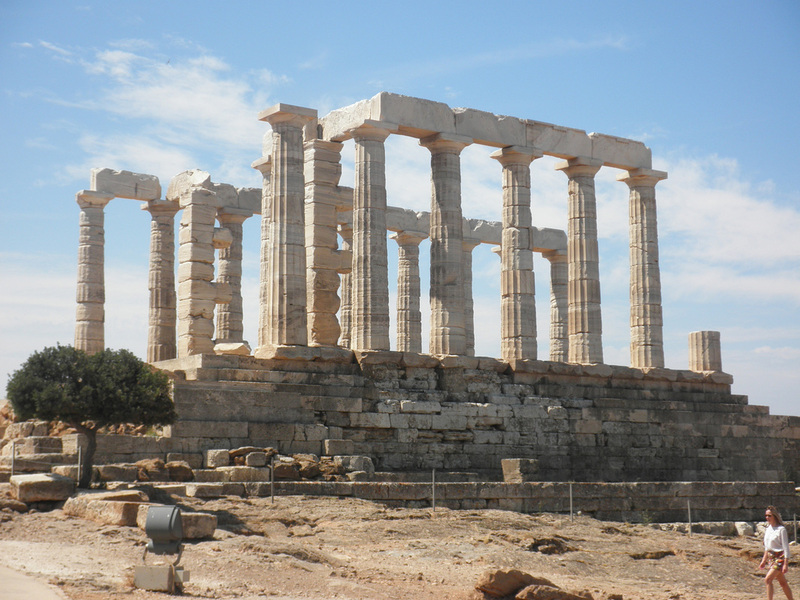 A Small Slideshow from our Visit to Sounion.